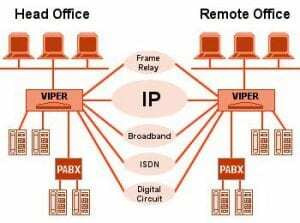 Office-to-office: Many primary rate ISDN circuits today are used for PBX networking using a multiplexer to allow data from a router to share some of the bandwidth. This is an inflexible solution requiring multiple units with expensive and inefficient permanently allocated bandwidth. A solution with ten voice channels plus 128 Kbps for data would require a 768k fractional Pri link. 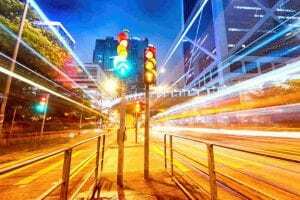 An equivalent Case Communications Viper solution would require only a 256 Kbps link, resulting in a significant saving in recurring line rental costs. It would also allow 150Kbps to 256Kbps for data depending on the number of active channels. Viper units networked together act as a distributed exchange allowing multi-channel Pri-Connections at the central site with a mix of Bri, AC15 / DC5 or even standard POTs phones at remote sites. Viper networking converts the different interfaces and protocols. Viper incorporates ITU – G.729A voice compression at 8 Kbps, which with silence compression and confort noise generation allows a reduction to less than 1 Kbps during pauses in the speech. The standards based header compression scheme ensures that the voice packets occupy only 9600 bps of the WAN bandwidth. Automatic fragmentation of datapackets where necessary and prioritisation of the voice ensures the quality of service (QOS) aspects needed for voice. Viper incorporates an IP/IPX router with multiple interfaces including ISDN Bri and serial synchronous WAN connections for Frame Relay and leased access, plus a serial port for HDLC pass through. The ISDN Bri can be used for 128 Kbps dial-up connectivity or for top-up/ backup on leased circuits. The PABX connection is via a multichannel Bri / Pri Interface. Quality of service (QOS) – The Viper ensures voice QOS by fragmenting IP packets and prioritising the voice. This is difficult to guarantee in other voice over IP products which do not have an integrated router. Cost-effectiveness – Viper single-box integration reduces capital costs by removing the need for separate router and voice units, and provides ongoing savings in line rentals through converged networking as well as reduced installation, maintenance, support and administrations.